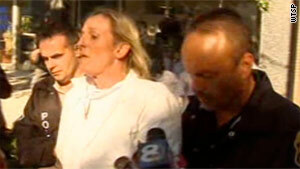 Julie K. Schenecker, 50, is charged with two counts of first-degree murder. Police say Schenecker admitted killing her two kids because they were "mouthy"
"Nancy Grace" has the latest on the Schenecker case, tonight at 8 p.m. ET on HLN. (CNN) -- Police opened, and then dropped, an investigation of physical abuse involving a Florida mother against her teen daughter, closing the case weeks before the woman admitted killing the girl and her brother because they were "mouthy." Julie K. Schenecker, 50, is charged with two counts of first-degree murder in the deaths of her 13-year-old son, Beau Powers Schenecker, and her 16-year-old daughter, Calyx Powers Schenecker. She was denied bond at a court appearance Monday, a court spokesman said. "Our belief was that she didn't snap -- she planned this," Tampa, Florida, police spokesperson Laura McElroy told HLN's Vinnie Politan on Monday. New details emerged about the alleged murder as well as a run-in Schenecker had with police months earlier, regarding her treatment of her children. In November, police opened a child abuse investigation into allegations Schenecker had abused Calyx, according to a report from the Tampa Police. A responding officer, Julie Becker, wrote that she didn't see any "visible injuries" on Calyx, nor did the girl complain of any. "She seemed cautious of what was saying, and at times began to cry," Becker said in her report. Calyx told police that days earlier her mother repeatedly hit her while they were driving home, before she was able to run to a safe spot in her room. The girl said that a month and a half earlier, her mother had hit her so hard in the face it caused her lip to bleed. Julie Schenecker told police she had hit the girl three times in the first incident after the girl told her, "You're disgusting," and "You're not my parent," according to the police report. She said Calyx was not bruised or bleeding afterward. The mother also admitted hitting the girl once more than a month earlier, according to her police statement, but she again denied that Calyx had bled. Becker noted, "There is no prior history (related to) this location and the family." On December 21, having found "no evidence of a criminal offense," authorities ended their investigation of the case. McElroy, the Tampa police spokeswoman, said Monday that the daughter's seeming "regret" over her comments and the fact no wounds could be seen prompted the investigators' decision. "Parents can discipline their children using physical force, as long as there's no injury," said McElroy. "That's why there was no criminal offense at that time." But McElroy said police determined on January 28 after they arrived at the family home that Schenecker had plotted to kill the teens. Authorities went to the house after getting a call from the suspect's mother who, after e-mail communications the previous night, was worried her daughter was depressed. Officers arrived at 7:45 a.m. to find Julie Schenecker on her home's back porch, "a little combative" and her clothing soaked in blood, McElroy said. Police then found Calyx's body in an upstairs bedroom. She had been shot twice in the head, police said. Beau's body was later found in the front seat of an SUV inside the home's garage, police said. They said he was shot while he was being driven to soccer practice. A preliminary investigation indicates the teens were killed Thursday night, the police statement said, but the county medical examiner will determine their time of death. Schenecker confessed to killing the children, according to a police statement, eventually recounting her rationale and thought process "in detail," according to a press release. "She did tell us that they talked back, that they were mouthy," McElroy told CNN affiliate WTSP late last week. "But I don't think that will ever serve as an explanation to the rest of us of how you could take a child's life." Schenecker had initially planned what she called the "massacre" -- killing the children and then herself, McElroy said on Monday -- for January 22, but she put it off after learning there would be a three-day check before she could buy a gun. Police later found writings in the house, thought to be from Schenecker, in which she spelled out her intentions in detail. "There are definitely indications that she planned this," McElroy said. "(The writing) was devoid of emotion." Schenecker's husband, Parker, is a colonel in the U.S. Army. He is a member of U.S. Central Command and police told CNN affiliate WFTS that he was in Qatar when his children were killed. Schenecker appeared in court Monday via video link from jail, WFTS reported. She held a tissue and wept softly during the two-minute appearance. Judge Walter Heinrich said at the hearing that Schenecker likely will undergo a psychiatric evaluation, according to CNN affiliates WTSP and WFTS. She did not enter a plea because of that likelihood, according to Hillsborough County Court spokesman Calvin Green. No new court dates are set in the case, Green said. Prosecutors have 21 days to present the case to a grand jury. The mourning for the young victims continues in West Florida, where a vigil was held Friday night. On Monday -- their first day back since the shootings became public -- students at Liberty Middle School in Tampa, wore blue and black in memory of Beau, an eighth-grader at the school. "We wanted to show him that we miss him and he didn't deserve this," Jae Shim, the boy's classmate and friend, told CNN affiliate WFTS. Those students had responded to postings on Facebook, where a page had been set up to honor the boy and his sister, a sophomore and cross-country standout at King High School. "Heaven is now home to two new angels," read one post, from Ron Taskey. "May you both rest in peace!" In Session's Aletse Mellado contributed to this report.